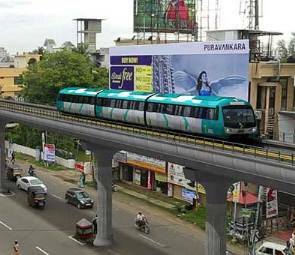 Kochi: The work of the Kochi Metro Rail project, which was slightly affected by the monsoon rains, regained momentum. According to the authorities concerned, the civil works of the project between Aluva and Maharajah’s College will be completed by the end of this year. As per the data provided by the authorities, a total of 240 girders (including ‘U’ and ‘I’ girders) were installed at the reach between Aluva and Kalamassery. Another 340 girders were already installed between Kalamassery and Jawaharlal Nehru Stadium. While between the stadium and Maharajah’s College, the contractors have already installed 130 ‘U’ and ‘I’ girders. There will be a total of 16 stations in the first stretch of Kochi Metro Rail, between Aluva and Maharajah’s College, that will be commissioned initially. These are Aluva, Pulinchode, Companyppady, Ambattukadavu, Muttom, Kalamassery, CUSAT, Pathadippalam, Edappally, Changampuzha Park, Palaraivattam, Jawaharlala Nehru Stadium, Kaloor, Lissie Jn, M G Road and Maharajah’s College. According to the officials concerned, nearly 50 percent of the work of the stations are completed. The remaining is expected to be completed by December this year. “The areas in the reaches where the civil works are already completed can be handed over for the laying of rails. For instance, in most of the areas between Aluva and Kalamassery, the civil works have been completed in stretches varying to a length of nearly two kilometres. These stretches will be soon handed over for the laying of rails which have been already brought to the nearest casting yards,” according to the officials concerned. Meanwhile, the work of the coach maintenance yard at Muttom is also progressing in full swing and the official said that the concreting works of the sub station building and the cabling shed for coaches is fast progressing. Though the actual deadline was scheduled for June 2016, the UDF lead Government wants an early commissioning of the project, before the launch of the election code of conduct for the upcoming Assembly elections. However, if the DMRC becomes successful in completing the work of the 18 km stretch between Aluva and Maharajah’s College before the deadline, it will be yet another national record with respect to Metro Rail construction. It took almost six years to complete the first 10Km stretch of Chennai Metro Rail, which was commissioned recently, while in the case of Delhi Metro Rail, it took more than four years for the completion of first 8.5-km stretch. Meanwhile, in Bangalore, the first 6km was commissioned after nearly six years from the commencement of work. Taking into consideration all these projects, the work of Kochi Metro Rail is progressing in a fast track mode, the official added.